Ruth Ellen Gruber has written an overview article for JTA about Holocaust accountability in Europe in the 20 years since the fall of Communism. Click here read column: "In Eastern Europe, advances toward accountability but more to do," by Ruth Ellen Gruber (October 28, 2009). Ruth interviewed me for the article. Its a topic that we discuss frequently. In looking over my extended comments (which Ruth herself could have made since due to our shared experiences our views are very close) I thought them worth sharing. As always, I appreciate, readers' reactions and comment. REG: Which [former Communist] states have made most progress coming to terms with this? Sam Gruber: When talking about Holocaust recognition and commemoration, all progress is relative. Some countries are much further along the path to historical accountability and sincere commemoration than others, but many have had further to come. Some countries are deeply divided with more liberal and internationally leaning political movements ready to discuss crimes of the past, while more right wing and nationalist parties feel that to do so is a form of self-hatred and near treasonous behavior. In all former Communist countries it has been necessary to overturn a half century of misinformation, and in many cases outright denial of many of the most basic facts of the Holocaust. Those countries which suffered the most under the Nazis - especially Poland and the Czech Republic - were most ready to accept the worst about them, and to acknowledge of horrors of the Holocaust. Those countries where wartime governments collaborated with Germany - such as Latvia and Romania have had a harder time, for to acknowledge Nazi crimes was in effect to acknowledge their own complicity. In the Baltic it has been even more complex, since throughout the decades of Soviet occupation the Nazis continued to be seen as liberators against the Russians by nationalists in Estonia, Latvia and Lithuania. Holocaust history was mostly irrelevant in the years of anti-Communist nationalists. Thus, to say it is difficult to say who has made the most progress. A small movement to recognize the historic truth of the Holocaust and to commemorate victims in a place like Latvia, and to acknowledge local collaboration, is to me as much progress, as has been done on the monument at Rumbula, is to my as much progress a large monument being erected in Poland, where all Poles see themselves as victims of the Nazis, and most are ready to accept the Jews as victims, too...albeit not always as a separate case. REG: What are the problem areas and why? Sam Gruber: There are problems on three levels. First, there is the problem of obtaining and confirming information about the Holocaust in particularly places. The more the local resistance to accepting the Holocaust as fact; the more important it is to be precise in the information that is presented. Second, there is the problem of disseminating information. For the most part the hardest populations to reach - and these are also sometimes the very ones that harbor traditional stereotypical notions of Jews (and others) - are those that only communicate in their local language. These populations tend to be the most traditional, the most parochial, the least educated, the least traveled and probably the most religious, where religion has retaken a hold. It has been slow going for international Holocaust education groups to prepare and disseminate materials in local languages, or to do it enough to combat the abundance of locally produced anti-Semitic and Holocaust denial material in these same countries. Local leadership is very important in acknowledging and commemorating the Holocaust. Mayors, teachers, priest, national leaders really can set the tone and established a better climate for education and dialogue. REG: What are some of best practice examples? Sam Gruber: I think the monument at Buchenwald in Germany, which tells the story of the Little Camp fully, and in sharp evocative language, and in many languages, is very successful. Because the monument was designed by a survivor of the camp it has special power. Its simplicity is a virtue. The monuments at the killing fields of Rumbula and Bikierniki Forest outside of Riga are also very moving, and very well done. Meanwhile, however, there are inadequate markers at sites within the city itself. I still find the Umschlagplatz monument in Warsaw very moving, though it requires some previous knowledge of the history of the site. The cemetery monument at Kazimierz Dolny, built in the 1980s, and the extensive monument at the Death Camp of Treblinka; also continue to serve well, though it may be time in both cases to add more explanatory and educational material. Not immediately as part of the artistic monuments, but nearby. Usually monuments that are destinations can be more symbolic, since it is usually assumed the visitor knows something or otherwise would not have come. Markers that appear in unexpected places, on buildings and streets, need to provide more information. Monuments such as that in Bratislava are, as I have previously written, unsuccessful because they mark a place but do not tell a story. They can serve as backdrops for scheduled commemorative events, but otherwise they serve little purpose. This is always the danger of the most official monuments – government sponsors always prefer to be vague – and not to alienate any constituency. REG: Have some states taken the right steps only to reverse them? Sam Gruber: It has to be understood that education is a slow process, and that changing inherited and accepted concepts and beliefs is a difficult task in any context. In this light, I think we can look at amazing progress over the past two decades. At the very time that most former Communist countries were grappling with them most challenging problems of nation building, identify, democratization and economic transformation, they have also changed many attitudes about the Jewish past in general, and the events of the Holocaust. 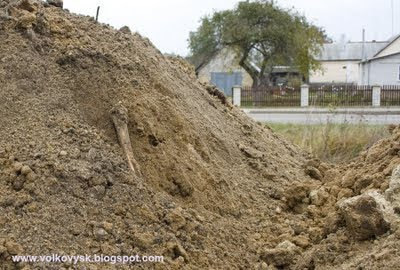 In many of these places, even the concept of a Holocaust separate from the devastation of the Great Patriotic War [World War II] had previous been unknown. The greatest willingness to consider, and even accept a basic history of the Holocaust has been greatest in those countries most closely associated with the West. It has been part of the process of granting democratic rights and religious freedom. It has also been the result of Eastern governments yielding to pressures from American a Europe if they wanted NATO and EU status. Thus Poland has been among the most receptive to Holocaust education, while UkraineBelarus have been much slower. REG: Some of your own personal experiences negotiating and monitoring Holocaust commemoration projects? Sam Gruber: After the problem of funding, the hardest part of getting monuments and memorials erected not been getting some kind of general consent, it has been working the specifics of design and especially of language. Most older memorials have been very general in their language – so much so that it is often hard to even figure out what events are being commemorated, and rarely can one learn about who did what to whom, and when. This began to change in the 1990s. In my experience with the US Commission [for the Preservation of America’s Heritage Abroad], it has always been part of the mission that monuments should be not only be symbolic, but that they must help tell a story. Hey need to be witness – clear voices in languages that local people can understand – and they must be as forthright and truthful as possible. Sometimes one could do this in Hebrew, Yiddish or English…local officials didn’t mind. But increasing there has been a push to get truth told in local languages, and that has meant sharp clashes with local Holocaust deniers, or with those who want to protect local reputations. These conflicts have slowed many monument projects…but ultimately they are very good…because it makes the education and commemoration process an active and forceful one, not just a passive act. In Latvia, at Rumbula, it took the personal intercession of the President of Latvia to make sure language was included on the inscription that mentioned Latvian collaborators. Another problem is using numbers – as in 10,000 Jews were killed. Frequently initial drafts of monument texts are changed to avoid that level of specificity. It is feared that if a number is contested and even disproved, even just by a bit, that such misrepresentation could be used to discredit the entire project, and by extension to paint an entire massacre, or even the entire Holocaust, as false. The installation of local monuments is often the most touching, since many non-Jews are eager to participate. The older people remember – and one can never by sure what exactly it is that they remember. The younger people are often eager to learn. Usually, the slower the project, and the more it is the result of a continuing dialogue and planning process that is inclusive of local people, the more successful the result, because local people have a proprietary stake in the project. Monuments that are erected without local involvement, but only through the time and money of “outsiders” – even if they are descendants of those murdered in the town – can be more controversial. REG: How important is this all, 65 years after the fact? Sam Gruber: Understanding the history of the Holocaust, including acts of complicity and acts of resistance; remains extremely important in this part of the world. Of course, it is important to Jews who want recognition of Jewish suffering, and acknowledgment of the extent of the destruction of an entire civilization. But it is equally important for the individuals and governments of those countries themselves since only by wrestling with their often contentious and convoluted histories can they reduce the likelihood of a future similar to the past. These are still fledgling democracies. Some have a vague memory of pre-Communist democratic institutions and objective historical research. Most, however, have been shaped by rigid ideology for most of a century. Thus it is one thing for Czechs - so close to Austria and Germany, to be attuned to political and historical revisionism of reconsiderations of the recent decades, but it is very different in Ukraine, which was never really independent, and has been under Tsarist and Communist rule since the 19th century. And those areas of - like Lviv - which were more international and multi-cultural before the Holocaust, are today incredibly homogeneous, with populations mostly drawn from the Ukrainian countryside, resettled in Lviv after World War II. For the most part they are not aware of any objective history, including their own. In Ukraine, Holocaust education must be part of a larger package of education about European history overall. People sometimes suggest that I write a book about Holocaust memory and monuments - mixing the political and the practical; aesthetics and altruism. It has been a nearly a generation since James Young published his important book Texture of Memory (New Haven: Yale University Press, 1993). That book was a primer for me, but James and I come to the subject from very different perspectives - in this case he as a critic and academic, while I am an activist and work with closely with Jewish communities. At the moment though I may have the focus to write such a book, I don't have the (almost greater) energy needed to seek out a publisher. But if any of my readers want to pursue this...by all means, let me know. (ISJM) Earlier this month I wrote about the pending dedication of the new Holocaust Memorial in Bucharest. Romania: Holocaust Monument to be Dedicated in Bucharest. The inauguration did take place, but the monument remains incomplete. For more and continuing information about the monument and and to see pictures of the inauguration and the structure click here for the web site about the monument created by Marko Maximilain Katz, Director of MCA Romania -The Center for Monitoring and Combating Anti-Semitism in Romania. Regrettably, many of the inscriptions which will tell some of the facts about the Holocaust in Romania, and which are the real rationale for the memorial, were not ready for installation. Bucharest, Romania. 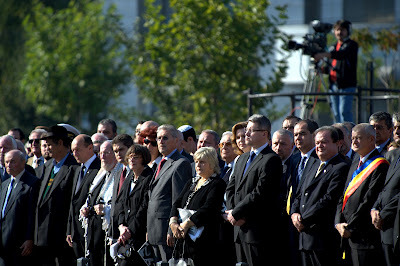 Inauguration of Holocaust Memorial, October 8, 2009. What participants in the formal ceremony and observers (including the Romanian and international press) saw was an architectural framework and an ongoing worksite. We have all experienced time and budget overruns on construction projects. Still, in the case of a much anticipated monument such as the one in Bucharest, we can certainly wonder why the decision was taken to dedicate it before its completion. Was it simply that the government sponsors thought the deadline of the local Holocaust Remembrance day would force the contractors to hurry up? Or were there other reasons? Has rushing the dedication in any way diminished the impact of the monument? K.K. Brattman, Managing Editor of the Holocaust Survivors and Remembrance Project: "Forget You Not" reacted strongly to the apparent inadequacies of the new monument, perceiving the one inscribed plaque in situ to be the only working that was to be included. This plaque merely indicates the sponsor and the artist, Romanian sculptor (who lives in Germany) Peter Jacobi. In fact, several more historical and commemorative plaques are still to be completed and installed. The texts to these plaques – or something close to the final texts – were apparently included in the program of the inauguration. I have been in contact with representatives of United States Holocaust Memorial Museum, the American Jewish Committee and the US Commission for the Preservation of America's Heritage Abroad, three organizations that actively pressured the Romanian government to create the Wiesel Commission, and then to follow through with many recommendations. They all shared the concerns of Mr. Brattman, but assured me that his concerns would be resolved when the monument was complete, with all the intended text. One problem causing delay was the Hebrew inscription, which was being engraved in Germany. According to my sources, there were problems, but I don’t know whether these were in the text, the translation or the actual carving of the Hebrew letters. Other source reported that at the time of the dedication, where many things were rushed, there may have been some issues about having the proper translations (it is in Romanian, English and Hebrew) or questions about misspellings, which could require it to be remade. I can attest from prior experience the difficulty in moving from idea to finished text on a Holocaust monuments. I have folders full of draft texts for monuments in Estonia, Croatia, Poland, Ukraine and elsewhere. Sometimes a single word or number - or the translation of the ta word - can hold up a project for a long long time. I encourage readers of this blog to report in from Bucharest with information and new pictures when they have occasion to visit the site. It was my destiny to have lived the best years of a person’s life during a dramatic turning point of history. It was a time when the commandment “Thou shall not kill!” was reversed. A time when the spiral of evil was expanding in Europe and all over the world, when anti-Semitism, hatred and discrimination were dominant and lawlessness became a state of the law. Its initiators conceived the Holocaust in such a way that it was supposed to have no witnesses or history. As you know, the fate of the war turned against them and there remained many witnesses. Thus, the Holocaust has a history. One of the witnesses is the person who wrote these lines. I belong to a fading generation: the survivors of the Holocaust. We all know that, as persons, we move in space and change in time. We can return to the same location in space, but never in time. Only memory remains, with what you were able to keep in mind. For me, memories are often conversations with the dead or with myself, as I was at a time and changed to what I am now. Sixty-eight years have passed since the freight trains, filled with the Jews who were deported from Bukovina, were running to the Dniester River. They “unloaded” the merchandise at the bank of the river for them to cross to “the other side”. At the same time, after the mass executions of the Jews, which took place in July-August 1941, when the troops entered Bassarabia and Northern Bukovina, the survivors were forced to walk, in convoys, to the same place. Whoever stayed behind was shot. I was part of those convoys when I hadn’t been 14 of age, yet. Having been looted of their goods, of their rights and especially of their right to live, the Jews were going to an unknown place, which also got a new name: Transnistria. The extermination policy was set into motion. Tens and hundreds of thousands of people were sentenced to death. Their only fault was that they were born and their parents were Jewish. It is true: no gas chambers were used in the Holocaust perpetrated by Antonescu’s government. People died from bullets, cold, hunger, insanitary conditions and disease (and they made “all the proper conditions” for it to appear). People also suffocated in tightly closed freight trains (the death trains from Iaşi). They were set on fire and blown up while crowded in warehouses. They were hanged (Odessa) and they died because the people around were bad. In this bleak picture, where the scene is mainly occupied by the victims, perpetrators and indifferent spectators, there were good people as well. They were not many, among those who believed in light, despite the general dark. They risked their own life so as to save others. The Holocaust is still here, in the memory of the few survivors. It is here with us in its whole horror. It was a cruel reality, a denial of any sense of morality, a denial of humanity. This memorial that we inaugurate now and here was made in honor of the victims of this cruel reality. As a tombstone for the ones who have no grave, the memorial will be a token for all those who want to know what happened. For, if we speak about learning from the Holocaust, it means we should not only tell the truth about the past, but also show how the same mechanisms act today in various societies and in people as well. The fear of unknown finds its release in the fear and hatred for the “stranger”. Intolerance, fundamentalism, fanaticism, they all get their nutrients and new energy precisely from this “fear”. This is why it is necessary to spread the knowledge about the Holocaust. By knowing our past, they will be able to act efficiently so that it does not become their future. It is possible that many will start thinking about what life and death is, and especially about what the world is. Even today, there are enough signs that warn about the always active potentiality of evil. People forget too often that whatever starts with the hatred against the Jews continues with the loathing of all that is different. Mankind, who created tyrannical utopias and suffered from their disasters, can now better understand the consequences of one’s deeds. This Memorial about people who existed at one time was erected for the people of today and of tomorrow. It is meant to remove indifference, the lack of knowledge about this matter and it should have an important contribution in this sense. Let me tell you that, despite of all that happened, I still believe that MAN should be the purpose of man, in life. Elkins Park, Pennsylvania (USA). Beth Sholom Synagogue (1953-57), designed by Frank Lloyd Wright. A new visitor's center for the Beth Sholom Synagogue, designed by Frank Lloyd Wright in Elkins Park, Pennsylvania, will be dedicated on November 15, 2009. 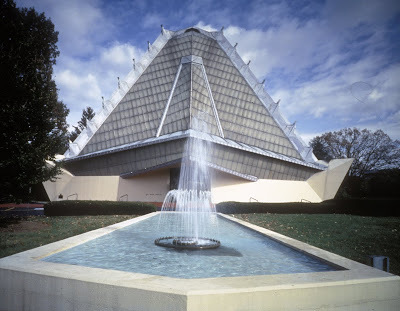 Beth Sholom, completed in 1959, is one of the best known and most reproduced synagogues in the world. Does that make it one of the best? I've always had mixed feeling about it. I appreciate it's design, but I have always found many aspects gaudy and overblown, and suspect that the big space is not particularly conducive for congregation building (but many large sanctuaries share this problem). On the other hand it's novelty has helped bring notoriety to the congregation and shape identity, and the exterior massing, the interior space, the changing natural light and the expressive originality always call one back to look and consider. It is often exciting, and certainly never boring. It amazes me that expressive modernism in this case is so venerated, while elsewhere it has been destroyed. This is due, of course, as much to the power of Wright's name as to (very real) virtues of the architecture. I've written more about the building in my book American Synagogues: A Century of architecture and Jewish Community (Rizzoli, 2003), 105-109. Beth Sholom Synagogue Preservation Foundation in Elkins Park, PA will dedicate its new Visitor Center with Paul Goldberger, the architecture critic for the New Yorker Magazine, who will speak about Beth Sholom Synagogue on the occasion of its 50 th Anniversary. Guests to the opening event will have an opportunity to see the newly created Visitor Center and to tour the National Historic Landmark building. 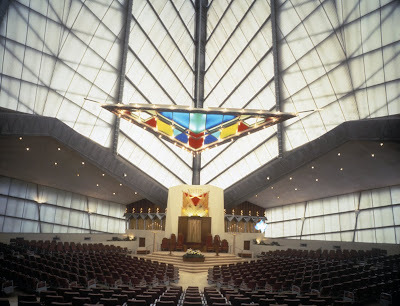 As the only synagogue designed by Frank Lloyd Wright, Beth Sholom stands as a monument both to twentieth-century design and Jewish interests. The Visitor Center was created to give a greater understanding of the building to the public and to provide an exciting experience that will complement tours of the Wright structure. The Visitor Center interprets Beth Sholom in the contexts of Wright’s life and work and American synagogue architecture. Included in the exhibition is an 18-minute film entitled: “An American Synagogue: Frank Lloyd Wright, Rabbi Mortimer Cohen and the Making of Beth Sholom,” produced by exhibition designers Picture Projects of New York. An extensive gallery of photos of the synagogue can be viewed here. Following the announcement of the executive committee of the European Association for Jewish Studies (EAJS), that its next Congress will take place in Ravenna, Italy, July 25-29, 2010, this is an additional call-for-papers for the section on "Jews in the Arts." The Congress theme is "Judaism in the Mediterranean Context" but proposals dealing with any aspect of Jews and the arts will be considered. "Arts" may be interpreted to as any number of creative expressions-such as music, dance, painting, sculpture, architecture, photography, and film. Information on the venue, transport and other practical issues will be available on the website (www.aisg.it/) on or before 1 December 2009. Proposals for papers (20 minutes + 10 minutes for discussion), with a title and a abstract of no more than 300 words, should be sent to Prof. M Berkowitz (m.berkowitz@ucl.ac.uk) and to the Congress Secretariat (eajs.ravenna2010@gmail.com) by 1 December 2009. The opening session will be held Sunday afternoon, July 25th 2010, and the conference closes the evening of Thursday July 29th, 2010. Registration for the Congress will open on 1 December 2009. In order to qualify for the lower congress fee for EAJS members, membership subscriptions must be paid up to and including 2010. Members in arrears should pay membership fees from the beginning of their membership or from 2006, whichever is the more recent. 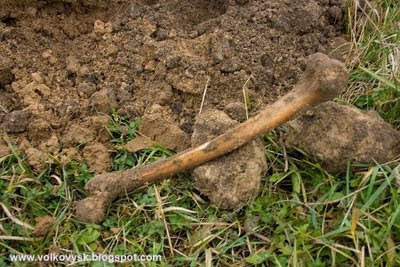 (ISJM) On October 21, 2009, a group of Israeli students visited the Polsih town of Knyszyn where they worked at the local Jewish cemetery together with Polish students from the School Complex. The group also toured the town and took part in joint workshops. This program was the latest implementation of the program ‘To Bring Memory Back’ developed in 2005 by the Foundation for the Preservation of Jewish Heritage in Poland to recover memories of neglected Jewish sites, and to connect the younger generation with the threatened legacy of the Jewish past. The meeting in Knyszyn was organized by the Foundation within the new project called ‘Haverim – Friends. Polish-Jewish youth meetings’. ‘Haverim – Friends. Polish-Jewish youth meetings’ derives directly from the ‘To Bring Memory Back’ educational program realized by the Foundation for the Preservation of Jewish Heritage in Poland’ since 2005. The paths of Polish students participating in the ‘To Bring Memory Back’ program and young Jews from Israel and the United States of America crossed in 2006, when Foundation, acting on request of one or our Israeli partners, arranged a visit of youngIsraelis to Zambrow. In 2007 three youth meetings were organized in August. Students from Debica, Kielce and Knyszyn along with their Jewish counterparts were visiting Jewish cemeteries, shared experience, exchanged addresses and made friends. In 2008 three more meetings were organized in Brody, Przemysl and Warsaw. In 2009 the meetings took place in Krasnik, Lublin, Otwock and Siedlce and a meeting in Knyszyn is scheduled for October. This visible growth of popularity resulted in the creation of the ‘Haverim’ program. The idea of the program is to break the clichés existing in both Poland and Israel. The students from Israel, who visit mostly Holocaust-related places and see Poles only through the windows of their buses have the opportunity to meet people their own age involved in the matter of preserving the historical heritage of Polish Jews. Young Poles can confront their expectations and knowledge gathered during the realization of the program with reality. Both sides involved may develop their sensitivity and openness to other cultures and religions, finally to discover that young people throughout the world have more in common than they realize. It is a perfect opportunity for them to get new pen pals and even friends for years, over the existing political, cultural and language barriers. The ‘Haverim – Friends. Polish – Jewish youth meetings’ is supported by the Chancellery of the Prime Minister of the Republic of Poland. (ISJM) The Jewish Telegraphic Agency reports the vandalism of a Holocaust monument in the Jewish cemetery at Klodzko in southwestern Poland last week. 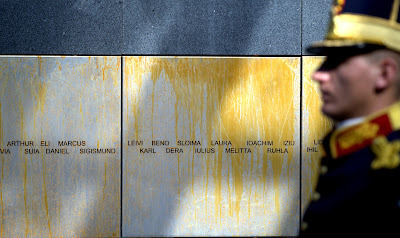 October 18, 2009 (JTA) -- Vandals defaced a Holocaust memorial at the Jewish cemetery in a town in southwestern Poland. 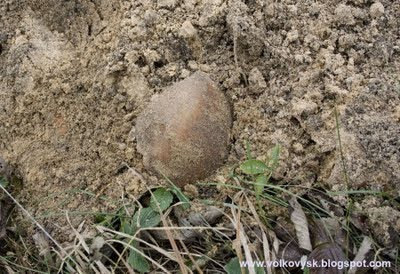 According to The Foundation for the Preservation of Jewish Heritage in Poland, unknown vandals threw white paint over the commemorative plaque affixed to the monument at the cemetery in Klodzko sometime last week. "Incidents like this undermine all good things happening in Polish-Jewish relations," said Monika Krawczyk, the foundation's CEO. There is no shortage of synagogues in Brooklyn. Many are beautiful and some are unusual, but most are unknown except to their congregants. In order to help protect this heritage of often aging religious buildings, the New York Landmarks Conservancy embarked in 2006 on a project to survey them. The New York Landmarks Preservation Commission has been taking a closer look at several individual Lower East Side buildings to determine if they meet standards for designation as New York landmarks, giving them substantial protection from demolition, and even significant exterior alteration. Jarmulowsky's Bank played a famous and infamous role in the financial lives and strife of Lower East Side immigrants. Together with the Forward Building, these two LES Jewish skyscrapers represented to diverse and sometimes contradictory aspirations of Jewish immigrants. In July 2008 I wrote about the National Trust for Historic Preservation raising the alarm about destruction in the Lower East Side…all in the name of progress (read: lucrative real estate development). (ISJM) This year, the conference of the Association of European Jewish Museums (AEJM) will be held in Athens, hosted by the Jewish Museum of Greece. According to the AEJM website, the program (preliminary version see below) will give "participants insights into the local Jewish history and culture with a keynote lecture by Prof. Euridice Antzoulatou-Retsila, as well as visits to sights and exhibitions in and around Athens. The conference will bring together museum professionals from all over Europe and will include workshop, keynote lectures and panel discussions, on themes such as Building Bridges with other minorities and the wider community. Participants are also invited to extend the program by an additional day (Nov. 25), in order to visit the Jewish Museum of Thessaloniki and sites of interest in that historic center of Jewish life." This will exploring the ways in which Jewish museums build connections to different audiences: to the Jewish community, to the wider community and to other minorities. • Greek Jewish Religious Art: unique features and common characteristics. This will be presented by Christina Meri, JMG curator, illustrated with actual artifacts. • Museum storage and preventive conservation policies: issues and solutions for small spaces. This will be presented by Mary Kapotsi, staff conservator. • Corpus of Jewish Inscriptions of Greece: a JMG project of European and International interest. This will be presented by Anastasia Loudarou, archaeologist, who is in charge of the project. • Educational programs and products: choices and challenges. This will be presented by Orietta Treveza, JMG education officer. • Designing exhibitions on a small budget: in-house solutions. This will be presented by Hayia Cohen, JMG graphic designer. 9:00 – 10:30 New Projects: Panel Discussion on innovative exhibitions and other inspiring projects – contributions are invited for this session. Those attending the conference are invited to transfer to Thessaloniki for a visit and further program at the Jewish Museum of Thessaloniki. This will include a bus tour of Jewish sites in the city, a meal and a guided tour of the Jewish Museum of Thessaloniki. I recently finished compiling Saving American Synagogues: Materials for a Preservation Manual (Part I) a 170 pp handbook and guide to the protection and historic preservation of older American synagogues. The manual is intended for two main types of audiences - congregations that are stewards of, and are sometimes just coping with an older building; and preservationists frequently engaged in the documentation, repair and preservation of synagogues. The work on the manual was funded by a grant from the James Marston Fitch Charitable Foundation. I am now discussing with colleagues how best to present this material - in print, on-line, etc [funders & publishers welcome to contact me directly]. This is not a manual that needs to be read from start to finish. It consists of dozens a short sections of specific topics. Some of these still need to be tested, many can stand alone. Many of these sections will soon be posted on the ISJM website. For the benefit of the many readers of this blog are are avid synagogues visitors - or who would like to be - I post the following small section (pp 60-62)- a simple guide to help those unfamiliar with a particular place. This manual is geared to American congregations and synagogues, but much of the materials carries over to synagogues worldwide. It is based on my own experiences, and on conversations with many others. 1.Feel free to visit a synagogue for services, but be prepared to follow local custom. Synagogue congregations (and clergy) are not secretive, but they may be parochial. 2.If you want observe a service (as opposed to participate in it), you are usually welcome, but if a stranger it is best to make arrangement ahead of time. 3.Entrance to synagogues these days is often not through what appears to be the front door, even for services of Sabbath and holidays. For practical and security reasons entrance may be through a side, back or service entrance. Just because the main (ceremonial) door is closed, don’t assume the building is closed. 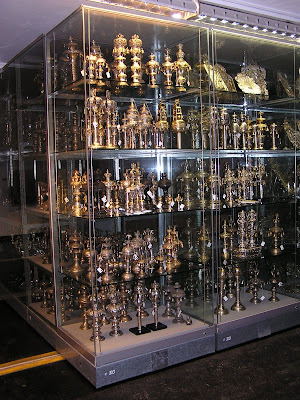 Many synagogues also maintain a full-time or part-time custodian (shammas) on the premise. Other synagogues may have schools or offices in adjacent buildings or building wings. 4.These days synagogues are very conscious about security. Do not be offended if you are subjected to various security measures. To minimize this, it is always best to call ahead if visiting a synagogue at any time other than for services. 5.Even if a building is open, it is best to find someone to introduce yourself to and to inform about why you are visiting. Quite likely, you’ll end up with a personal guided tour. 6.If a stranger to a synagogue, it always helps to have a printed business or visiting card that you can leave. In some places, especially in Manhattan, it may be necessary to show a photo ID (for security). 7.All synagogues have different norms for dress, and these vary by season and time of week. To be safe, it is best to always dress respectfully, as if for work, church or any official meeting, when visiting a synagogue for the first time. Even for a casual visit, men should wear long pants, and a button down or polo-type shirt. For women, dresses, skirts, or work-style slacks are best. Best to have sleeves and higher necklines. If you have previously arranged to look at a building top to bottom – roof to basement – then more casual clothes are fine. 8.If you are in an Orthodox, Conservative or Reconstructionist synagogue and are a Jewish man, it is expected that you will wear a kippah (yarmulke), at least in the sanctuary, whether for services or not. Kippot are usually available and in view, if not just ask. Or wear a baseball cap or other hat. 9.If you are in an Orthodox, Conservative or Reconstructionist synagogue and not a Jewish man, wearing a kippah (yarmulke) or other head covering is optional, but can be sign of respect. When in doubt wear a baseball cap or other hat. 11.If you visit an Orthodox synagogue on the Sabbath do not bring a camera or tape recorder or propose any sort of work (photos, interviews, etc.) or use of money unless expressly invited to do so beforehand. Be sure your cell phone is turned off. 12.When Orthodox services are in progress, you can be an observer, and if Jewish, participant. Women will have to sit with women, men with men. 13.When Conservative or Reform services are in progress, you should feel free to follow along in the prayer book, which includes lots of English and has much that is universalist in its language and message. 14.Jews like music. Feel free to sing along to prayers and songs – and to even chant or hum the melody of you do not know the words. Many prayer books now include transliteration of Hebrew prayers and songs so that even those illiterate in Hebrew can join in. 15.Generally, Jews and especially rabbis will be happy to explain aspects of their worship or behavior when asked out of genuine interest. This is true in the more liberal movements, but also true of some Orthodox, especially Chabad Lubavitch. Again, the visitor should respect local custom and not ask questions during services. 16.Assume that Reform and Conservative congregations will be mostly familiar with popular culture reference points, and shared American experience. More Orthodox congregations and especially some Hasidic groups are likely to be more isolated. Still, even the most Orthodox Jews are not Luddites, they may be well-tuned to new technologies as well as current events. 17.When in a synagogue when there are no services feel free to walk and look around, and to ask any question that comes to mind about what you see. But be careful, don’t assume answers about history, art, architecture will be accurate – even when given with great sincerity. 18.Do not open the Ark on your own. It may be considered disrespectful, and the Ark may also be alarmed to prevent theft of precious Torah scrolls. If you are being shown the synagogue, however, do not hesitate to ask for the Ark to be opened so you can see any interior decoration, and also the decorations of the Torah scrolls. 19.Most congregations will allow photos of their sanctuaries, but it is always best to ask first. Especially ask about photos of the open Ark. If one person refuses to allow photos, try explaining your purpose to someone higher up – either the rabbi or an administrator. You can also offer copies of the photos for use by the synagogue – online or otherwise. Some synagogues refuse photos for security reasons, but most because they are embarrassed if something is messy or needs repair. 20.Many synagogues have tables or racks with copies of announcements and bulletins. Feel free to look at these, and take copies with you. If you have a strong interest in a building, you should ask if there are other publications. Many congregations have old copies of brochures, program and publications that give information. Larger congregations sometimes have libraries where copies of historical materials are kept for consultation. Many synagogues also have a member who is an official or unofficial congregation historian. 21.Feel free to share your historical, art, architectural, technical or other knowledge and information with the synagogue clergy and staff. 22.Do not call the synagogue a church; do not call the Ark (Aron-ha-Kodesh) an altar. 24.Women, be aware that some Orthodox men (especially rabbis) will not shake a woman’s hand. To avoid embarrassment, let the rabbi or Orthodox attendant make the first move. The website www.jewish-heritage-europe.eu has posted an extensive list of Jewish heritage sites in Austria. The Austria pages are divided into three sections: An Introduction, Austria 1 (Vienna), and Austria 2(Outside Vienna). The site lists museums, collections, libraries, synagogues, cemeteries, memorials and other sites with Jewish associations. I have been providing comprehensive lists to Jewish-Heritage-Europe.eu, and more than twenty countries are now posted. Detailed lists for Bulgaria and Greece will be posted soon. Sharman Kadish and Jon Cannon in the UK also contribute to the writing and editing process. New York, NY. 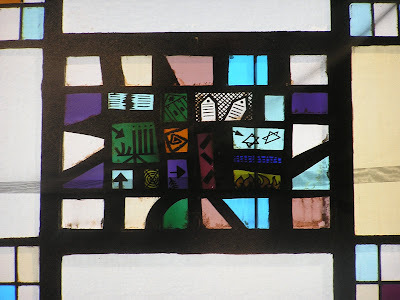 Congregation Ohab Zedek, from When Harlem was Jewish by Jeffrey S. Gurock. New York, NY. Baptist Temple Church before demolition. Note removal of Jewish symbols from facade. 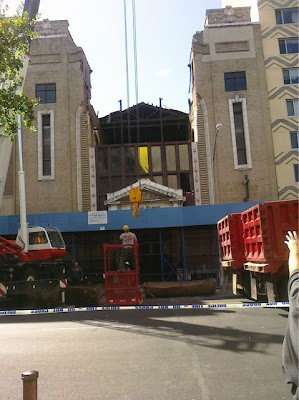 (ISJM) Last week city workmen torn down part of the facade and roof of the former Congregation Ohab Zedek at 18 West 116th Street in Harlem New York The structure has served a Baptist Temple Church for more than a half century. The New York City Department of Buildings took action because of structural damage to the church. There was a large crack running through the top part of the facade which the city feared would collapse. The cause of the crack is undetermined, but it may be in part the result of destabilization caused by the considerable construction work in the neighborhood in recent years, including the a large apartment building erected immediacy to the east of the 1906 brick sanctuary. At the time of writing it is not clear what the future hold for the building. The only likelihood of rebuilding would be if the damage caused by the crack and subsequent demolition is covered by insurance. Even if that is the case, it is unlikely that insurance would cover any subsequent damage caused by the building's being opened to the elements. It is reported that the roof over the far end of the sanctuary remains intact. 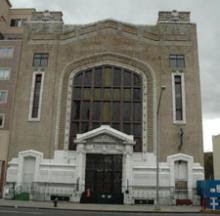 Congregation Ohab Zedek was one of the many synagogue founded in Harlem at the beginning of the 20th century. 1906 was also the year the construction began on nearby Temple Israel, now Mt. Olivet Baptist Church. Ohab Zedek was founded by Hungarian Jews who had moved north from the Lower East Side. The congregation modernized with the new buildng, hiring its first English-speaking rabbi and introducing wildly popular Yossele Rosenblatt as its cantor. Across the 116th Street, according to Dunlap, at "at No. 37, is the Salvation and Deliverance Church. This was once Rabbi Herbert S. Goldstein's Institutional Synagogue, which drew new generations to Orthodoxy by offering social, educational and recreational services, inspiring a phenomenon known as the ''shul with the pool.'' Goldstein held huge youth rallies in a nearby theater." This demolition calls to mind the collapse and consequent demolition of the First Roumanian Congregation on the Lower East Side, and points out how threatened many older religious buildings are. Even building that are in use and seem viable can be overwhelmed by catastrophe in an instant, and not survive the blow. To my knowledge Baptist Temple Church was never fully documented - all churches and synagogues should be both for history and for their own insurance purposes. (ISJM) The Foundation for the Preservation of Jewish Heritage in Poland has installed an information plaque at the Jewish cemetery grounds in Izbica, Poland, where conservation work has been underway since 2006.. The cemetery was established in the second half of the 18th century and severely damaged during the World War II. 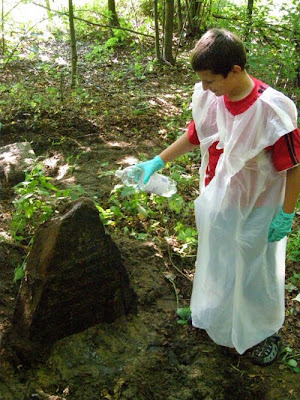 Since 2006 the Foundation has pursued a program of cemetery protection and preservation. A monument to the Jewish community of Izbica. The monument was funded by the Embassy of the Federal Republic of Germany in cooperation with the Foundation was unveiled in November 2006. During the World War II the Jewish cemetery in Izbica was desecrated, its fence was destroyed and the matzevot were used for constructing the Gestapo prison building. In September 2006, the Foundation for the Preservation of Jewish Heritage, along with Tvschoenfilm, demolished the former prison building. After the demolition works were completed, the matzevot were moved back to the cemetery: those that were best preserved were installed on the walls of an ohel of the famous Tzadik of Izbica, Mordechai Josef Leiner, the others were secured. In the future they will be built in the cemetery’s new fence. The works were filmed by Tvschoenfilm; they will be used in a documentary about Kurt Engels, the boss of Gestapo in Izbica and one of the war criminals involved in the Reinhardt Operation. The film will be aired by the German ARD Television. In autumn 2006 the Embassy of the Federal Republic of Germany had joined forces with the Foundation to realize the IZBICA JEWISH CEMETERY COMMEMORATION PROJECT. The financial support of the Embassy allowed the Foundation to erect a monument commemorating the Jewish community of Izbica, publish pamphlets presenting the history of the town (in Polish and in English), organize educational activities for the students of the Izbica School Complex and, finally, to trace the geodesic boundaries of the cemetery and design a new fence. On November 16th, 2006, a ceremony of unveiling of the monument commemorating the Jewish community of Izbica took place. The ceremony was attended by the Israeli Ambassador, Mr. David Peleg, the German Ambassador, Mr. Reinhard Schweppe, a representative of the President's Office, Ms. Malgorzata Zaluska, the Chief Rabbi of Galicia, Rabbi Edgar Gluck, a deputy bishop of the Lublin Archidiocese, bishop Mieczyslaw Cislo, representatives of the local authorities and the Izbica Mayor. The ceremony was also witnessed by a crowd of local citizens and children from the School Complex in Izbica. The teachers and students of the School Complex in Izbica have been taking care of the Jewish cemetery in Izbica for many years, trying to discover the past of their town. In June 2003 the school, with help from Robert Kuwałek, Director of the Belzec Memorial Museum, started cooperating with the German organization Bildungswerk Stanislaw Hantz from Kassel. In September 2005 the School Complex in Izbica joined the educational program "To Bring Memory Back", launched by the Foundation for the Preservation of Jewish Heritage. 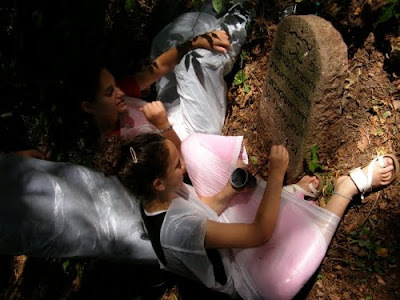 Within the framework of the „To Bring Memory Back” program the students take care of the Jewish cemetery, discover Jewish history and culture, and explore the history of the Jewish community of Izbica. They also undertake public activities leading to bring to the inhabitants of Izbica the memory of their past. On December 19, 2006, the Foundation for the Preservation of Jewish Heritage organized for the students of the Izbica School Complex a workshop on Jewish culture and history, dedicated also to the educational program's method and the realization of public activities.We certainly hope that thanks to the workshop, led by experienced animators, young people of Izbica will manage to invite many other inhabitants of their town to join them in taking care of the cemetery and exploring the past of Izbica. The final stage of the IZBICA JEWISH CEMETERY COMMEMORATION PROJECT will be fencing the cemetery. The cost of this undertaking is estimated for 50 000 €. The Foundation is now seeking partners who will help us to complete this task. Read more in the highly informative and well illustrated Brochure 'Izbica. A Story of a Place'. Samorin, Slovakia. Two views of the former synagogue, now listed on the Slovak Jewish Heritage Route. Photos: Samuel D. Gruber, 2009. (ISJM) Maros Borsky reports from the Slovak Jewish Heritage Center in Bratislava that more information on the Slovak Jewish Heritage Route is now available on-line. This includes an interactive map of the Slovak Jewish Heritage Route, presentation of Dr. Borsky's book on the synagogues of Slovakia, and the integration of the site's older webdatabase about Slovak Jewish heritage. A special feature highlights an "event of the month." This month's report is that Slovak Jewish Heritage will be presented at the Donumenta festival in Regensburg, Germany, an annual cultural festival organized in the Bavarian city that every year presents another country from the Danube Region. This year the festival is dedicated to Slovakia and the Slovak Jewish Heritage Center is included with a photographic exhibition of Jewish monuments in Slovakia. The exhibition is the first opportunity for the German public to learn about Jewish heritage in Slovakia. According to Borsky,"The Slovak Jewish Heritage Route is a complex project that includes research, educational and promotional activities. It is aimed at advocating preservation of Jewish heritage in Slovakia as well as sustaining this attitude. These activities are to a great extend based on the results of the Synagoga Slovaca documentation project of synagogues, conducted in 2001-2006. The outcome of the survey (architectural plans, photographs, descriptions) is used to create an audience for Jewish culture in Slovakia, shape cultural policies and contribute towards improved site management. Within the framework of project we provide guidance and advice to the owners of synagogues and Jewish heritage sites in Slovakia. Managing the European Day of Jewish Culture and the European Routes of Jewish Heritage in Slovakia is a core activity of the project." Some of the synagogues on the Heritage route, such as the grand nine-bay synagogue of Stupava, have been previously featured on this blog. The Government of Romania has announced that a Romanian National Holocaust Memorial will be dedicated in central Bucharest on Thursday, October 8, on the occasion of Holocaust Commemoration Day. The memorial, designed by artist Peter Jacobi, will commemorate the hundreds of thousands of Jews, Roma and other Romanian victims of the Nazis and their Romanian allies and collaborators. The erection of the monument was announced several years ago as a result of intense criticism of Romanian government leaders' denial that there had been a Holocaust in Romania, and their efforts to distance past Romanian governments from Jewish and Roma suffering. Under Communism and in the post-Communism years official policy was that the Germans were the perpetrators of the Holocaust, and that Romanian leader Antonescu was not involved, this despite the destructive policies of Anotonescu's regime. As a result, an international commission headed by Nobel laureate Elie Wiesel, was established to provide the factual basis for Romania to re-evaluate this period of its history - a history which has been frequent neglected, distorted or denied during the decades of Communist rule. Wiesel is a native of the town of Sighet, now part of Romania. 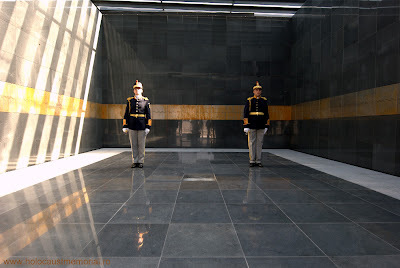 One result of the Commission's recommendations, included in the its 400-page report, is that President Traian Basescu laid the cornerstone for the new memorial in 2006. He is expected to attend the dedication of the near-complete monument this week, together with Holocaust survivors and dignitaries from several countries. The Romania Ministry of Culture, Religious Affairs and National Heritage described the monument as "a contemporary expression of a memorial, the bearer of a message, a visible sign, an active space with which the public can interact freely." It consists of five symbolic sculptures symbolizing representing the suffering of Jews and Roma. There is a central memorial site and two installations using Jewish gravestones that from local cemeteries that had been desecrated. Attending the dedication from the United States will be Warren Miller, Chairman of the U.S. Commission for the Preservation of America's Heritage Abroad, and Rabbi Andrew Baker, director of International Affairs of the American Jewish Committee, who also serves as the OSCE representative on combating anti-Semitism. Until now, the only other monument to Holocaust victims in Bucharest is a memorial erected in 1991 by the Jewish community in front of the Choral Synagogue, the center of Romania’s Jewish communal life. At that time, in a public ceremony, Romania’s chief rabbi and other representatives of Jewish groups publicly denounced the Romanian involvement in massacres of Jews during the Holocaust, and the country’s subsequent silence about the matter. The ceremony took place in the wake many anti-Semitic episodes following the fall of dictator Nicolai Ceacescu. The inscription on the monument, which was erected in front of the Bucharest’s Choral Synagogue, explicitly refers to “German, Romanian and Hungarian fascists” as the perpetrators of the murders of 400,000 Romanian Jews. The stark bronze monument, in the form of a giant menorah set on a marble base, was unveiled to the accompaniment of a military band. Separate from the main monument, along a wall flanking the forecourt where the monument stands, is a listing of the various places of death and the numbers of people killed in each place. At that time, Elie Wiesel unveiled the plaque commemorating the murder of 150,000 Jews in Transylvania, where he was born. Weisel was quoted in the New York Times as saying “I address my words to the leaders of this country. I hope you know that your representatives have great difficulties in the world to mobilize sympathy, political and economic support for you. Your image is not the best. You must know that. You must know that unless these anti-Semites are shamed in society, you will suffer. You will be isolated. Neither the Romanian president nor prime minister attended the event, though both sent word of sympathy and support. 18 years later, this week's ceremony is intended to rectify the situation. It remains to be seen whether this will be merely a temporary symbolic gesture, or whether it will have lasting meaning in Romania. There are several other monuments to Holocaust victims scattered through Romania. A prominent figural monument to the deported in Dej by sculptor Izsák Márton was erected in the 1980s or earlier. Few other monuments, however, appear to be prominently sited. Several are in Jewish cemeteries. These include a memorial to the deported in Cluj and a monument at the cemetery in Podul Iloaei, to those who died on the Death Train from Iasi. There are no longer any Jews in this town but the cemetery and monument are well maintained. There is also a monument to the victims of the Iasi Death Train in the Jewish cemetery in Roman.